As a palliative care doctor who works in an outpatient cancer center, I have come to value the time I get to see the patient concurrently with the oncology team. I am able to learn much more about the particular individual case, so I can be more helpful to the patient. But in the long game, the added benefit is a more nuanced understanding of the oncologist-patient relationship. Hearing the language an oncologist speaks to a patient is much different than having an oncologist give me a 45-second summary of that same discussion and medical plan. Yet, I suspect my mere presence (even when non-participatory) changes the nature of these conversations, a la the Hawthorne effect. The basic info about the visits (time, structure and broad themes) I found the most interesting, and for most clinicians it leads to the strongest behavior changing items. More on that in a minute. The team spent much of the time doing Conversation Analysis (with capital letters), a very involved qualitative research method. A 10-minute conversation may take 10 hours to code as they listen for changes in pitch, volume, tone, pauses and prosody. Prosody, prosody...such a lovely word, you may be thinking, I should know what that means. Prosody, a term which here means pattern and tone to ascribe meaning to a spoken word or phrase. For those many of you in palliative care who geek out on communication, make sure to read the Appendix, where they explain laudable event proposals, blocking, objectionable projections, appreciation sequences. I will be on the look out for these next week in clinic. Some even emerging from my own vocal cords, because these exist beyond the domain of oncologsts. 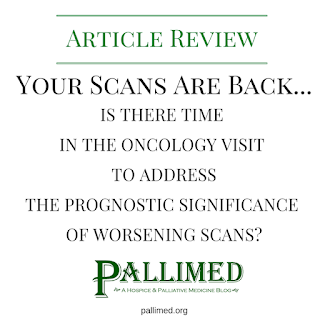 While there were cues patient and oncologists gave each other to signal and keep this usual pattern, the researchers noticed it was the oncologist who was often in control of the transitions which also happened to be fast with little time for questions or exploration. When bad news was given, the time of the visit was usually longer and a higher percentage of time was spent on treatment-talk and much less time on symptom talk. This syncs with my experience as a clinician. Knowing the scans/labs are worse and time will be needed to discuss treatment options, any presenting symptoms are either already considered to be associated with the bad labs/scans, or deemed not as critical as plotting a new treatment course, so both the patient and the doctor may implicitly agree to spend more time there. Yet, this also reinforces a critical point of the intersection of palliative care in an oncology clinic. A patient with progressive disease may benefit from palliative care because clearly, the prognosis is not getting better and more support may be needed. In addition, the regular clinical oncology interaction has already been squeezed for time addressing symptoms because of an intense focus on an oncology treatment plan. While not an intervention study, the researchers propose a simple question which fits into the normal phase structure, and allows room for patients and oncologists to open the prognostic discussion, especially in light of bad news or stable news which isn't always great either if side effects of treatment are becoming intolerable. 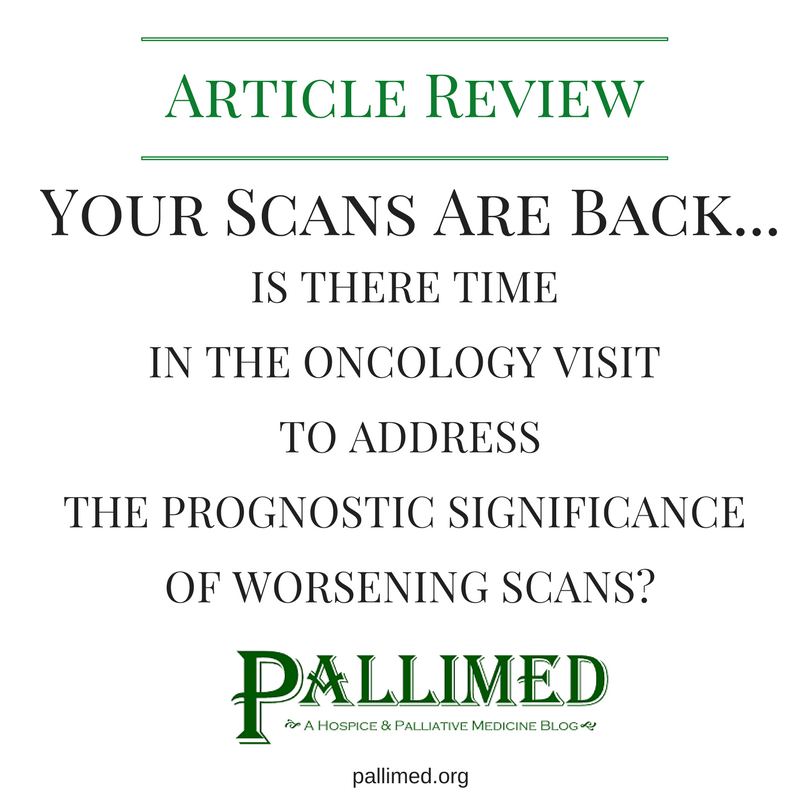 In between scan-talk and treatment-talk, the authors encourage pausing to ask the patient, "Would you like to talk about what this means?" This allows patients to give permission to the oncologist to talk explicitly about prognosis, express emotions, or decide to skip over any of the hard stuff and go right to 'What other chemos do you have, doc?" "Would you like to talk about what this means?" The growing literature on patient-clinician discordance on prognostication reminds us we need to do something differently. I recently gave a talk on communication and prognosis (just last week). But I had not seen this study yet. I will definitely add it to this slide deck for next year! I think I could add that to my own communication tool-kit, and could see sharing it with my oncology colleagues with possibly some good uptake. Also for ease of sharing online we have created a square and letterbox graphic reviewing this important article. Please share widely. Christian Sinclair, MD, FAAHPM is editor of Pallimed, and a palliative care doctor at the University of Kansas Health System, and works with a number of fantastic oncologists. He does not condone oncology bashing by anyone in palliative care. Their job is tough, let's walk with them. Image Credit: Table 1 is from the article reviewed. - Original copyright of American Society of Clinical Oncologists. Used here under fair use for educational and critique purposes.